The Pale Banded Snail has, as the common name suggests, a pale, yellowish shell with many strong, dark brown spiral bands. It also has a dark brown patch behind the outer lip and on the umbilical region on the base of the shell. This is a reasonably large species with a low, dome-spired shell that can grow to around 35 mm in diameter. The animal is a striking pinkish orange with a red mantle. It can be found living under and inside logs, and under rocks, tree-stumps and debris in open forests, woodland, vine thickets and in suburban gardens. 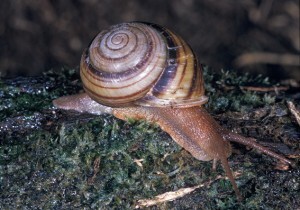 The Pale Banded Snail ranges from about the Tweed river region in northern New South Wales northwards to the Broadsound Range, north-west of Rockhampton, and inland to the Carnarvon area, Queensland.